Blizzards. Floods. Ice storms. Thundersnow. Hurricane-level winds. Plagues of locusts. OK, maybe not that last one. But all the rest of these hit hard this weekend, breaking records just as predicted — and in some cases even more than what was forecast. 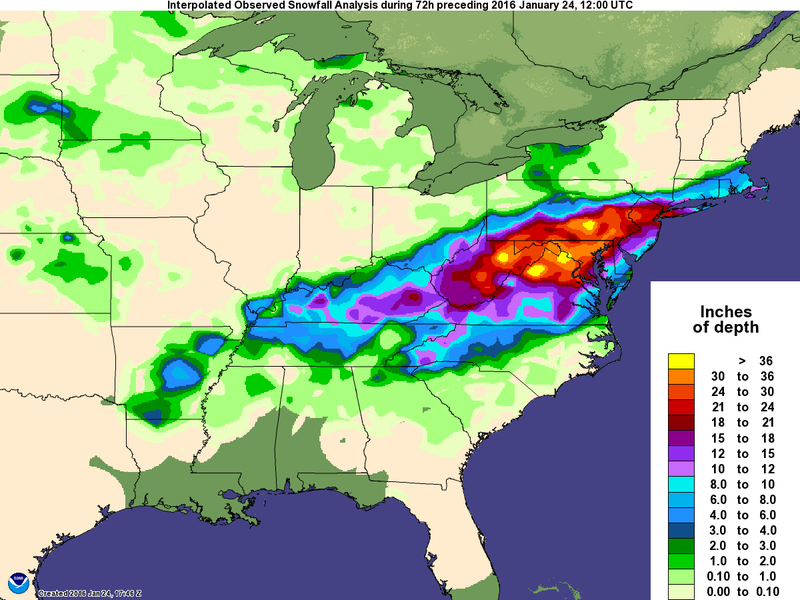 New York, Maryland, and Pennsylvania in particular, saw a lot of snow-records fall. But even places where a number-one spot wasn’t quite there saw an amount of snow that was well within the top few snowstorms in living memory. The US National Weather Service put together this look at how the different airports fared in terms of record-setting. When you look at these numbers, it’s crazy that more travel problems didn’t occur. Though the snowfall-levels were shattering records right and left, this storm was only partially about the snow. What else was going on? In a word. Everything. New Jersey and Delaware both had record-breaking coastal floods, with waters reaching even higher levels in some places than during Hurricane Sandy back in 2012. Virginia, Massachusetts, and Delaware all saw wind gusts in the mid-70 mph hour range, just a few miles per hour below what they would need to be classified as a hurricane-strength winds. Kentucky, the Carolinas, and Tennessee all saw freezing rain accumulate into a hard sheet of ice, in some places up to half an inch thick. In some ways, this wasn’t a surprise. Going into the storm, US National Weather Service director Louis Uccellini told us that one of the unusual things was just how consistent all the models had looked — and all of those models showed a truly alarming winter spectacle descending upon the eastern US. To see just how intense predictions looked, check out this model NASA put together, which tracks the storm right from it’s beginning stages all the way through when it wrapped up yesterday. As you can see, one of the most striking things about this predicted storm was that it simply didn’t let up, from start to its finish. In a lot of ways, we got just exactly what the models showed us we’d be getting. In fact, when real life strayed from the model, it ended up a little closer to what even a pessimistic weatherman would have call the worst-case scenario before the storm.